OMG! My complaint in MS was forwarded to the Supreme Court. Chief Justice appointed a Special Judge to handle my complaint. See order below. Thank God the things started to move, I don’t know, if I can withstand the stress for much longer. So began the quote from the email sent by Orly to bob strauss, who posted her ‘news’ on CW’s blog, along with a link to her site. Until that point, I had no idea she had filed a ballot challenge in MS, let alone that it had wound its way to the Supreme Court, especially given the fact, as I already knew, MS had no candidate ballot eligibility law for the party’s Presidential preference primary. So, as I had done when bob posted her previous headlines with respect to GA – “I WON!!! I WON!! !” – I clicked on the link. Here is the entire title of this post announcing the judge’s interlocutory or interim court order in the MS complaint, just as it appeared on her blog. What caught my eye immediately was that this time, Orly was the named Complainant! And, it appeared she had misidentified the name of the Mississippi Democratic Party, calling it the “Democrat Party of Mississippi.” Of course, I looked that up; yes, it is the Mississippi Democratic Party. Next, having never examined her underlying case; I now looked for the reason the MS state supreme court had issued this order. 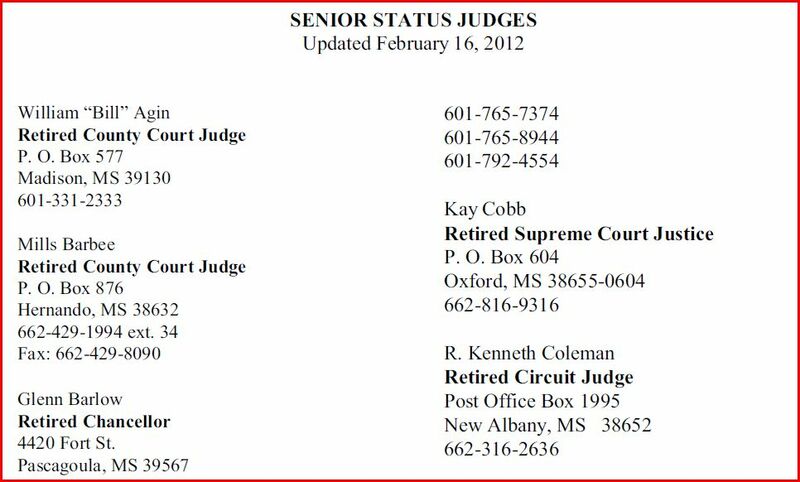 I looked up the name of the judge who had signed the order – yes, he sat on the MS supreme court bench – and then, I looked up the law he had referenced as the basis for that order, Mississippi Annotated Code 23-15-961. .
(1) Any person desiring to contest the qualifications of another person as a candidate for nomination in a political party primary election shall file a petition specifically setting forth the grounds of the challenge within ten (10) days after the qualifying deadline for the office in question. Such petition shall be filed with the executive committee with whom the candidate in question qualified. (2) Within ten (10) days of receipt of the petition described above, the appropriate executive committee shall meet and rule upon the petition. At least two (2) days before the hearing to consider the petition, the appropriate executive committee shall give notice to both the petitioner and the contested candidate of the time and place of the hearing on the petition. Each party shall be given an opportunity to be heard at such meeting and present evidence in support of his position. (3) If the appropriate executive committee fails to rule upon the petition within the time required above, such inaction shall be interpreted as a denial of the request for relief contained in the petition. (4) Any party aggrieved by the action or inaction of the appropriate executive committee may file a petition for judicial review to the circuit court of the county in which the executive committee whose decision is being reviewed sits. Such petition must be filed no later than fifteen (15) days after the date the petition was originally filed with the appropriate executive committee. Such person filing for judicial review shall give a cost bond in the sum of Three Hundred Dollars ($ 300.00) with two (2) or more sufficient sureties conditioned to pay all costs in case his petition be dismissed, and an additional bond may be required, by the court, if necessary, at any subsequent stage of the proceedings. (5) Upon the filing of the petition and bond, the circuit clerk shall immediately, by registered letter or by telegraph or by telephone, or personally, notify the Chief Justice of the Supreme Court, or in his absence, or disability, some other judge of the Supreme Court, who shall forthwith designate and notify from the list provided in Section 23-15-951 a circuit judge or chancellor of a district other than that which embraces the district, subdistrict, county or any of the counties, involved in the contest or complaint, to proceed to the county in which the contest or complaint has been filed to hear and determine the contest or complaint. It shall be the official duty of the circuit judge or chancellor to proceed to the discharge of the designated duty at the earliest possible date to be fixed by the judge or chancellor and of which the contestant and contestee shall have reasonable notice. The contestant and contestee are to be served in a reasonable manner as the judge or chancellor may direct, in response to which notice the contestee shall promptly file his answer, and also his cross-complaint if he has a cross-complaint. The hearing before the circuit court shall be de novo. The matter shall be tried to the circuit judge, without a jury. After hearing the evidence, the circuit judge shall determine whether the candidate whose qualifications have been challenged is legally qualified to have his name placed upon the ballot in question. The circuit judge may, upon disqualification of any such candidate, order that such candidate shall bear the court costs of the proceedings. (6) Within three (3) days after judgment is rendered by the circuit court, the contestant or contestee, or both, may file an appeal in the Supreme Court upon giving a cost bond in the sum of Three Hundred Dollars ($ 300.00), together with a bill of exceptions which shall state the point or points of law at issue with a sufficient synopsis of the facts to fully disclose the bearing and relevancy of such points of law. The bill of exceptions shall be signed by the trial judge, or in case of his absence, refusal or disability, by two (2) disinterested attorneys, as is provided by law in other cases of bills of exception. The filing of such appeals shall automatically suspend the decision of the circuit court and the appropriate executive committee is entitled to proceed based upon their decision unless and until the Supreme Court, in its discretion, stays further proceedings in the matter. The appeal shall be immediately docketed in the Supreme Court and referred to the court en banc upon briefs without oral argument unless the court shall call for oral argument, and shall be decided at the earliest possible date, as a preference case over all others. The Supreme Court shall have the authority to grant such relief as is appropriate under the circumstances. (7) The procedure set forth above shall be the sole and only manner in which the qualifications of a candidate seeking public office as a party nominee may be challenged prior to the time of his nomination or election. After a party nominee has been elected to public office, the election may be challenged as otherwise provided by law. After a party nominee assumes an elective office, his qualifications to hold that office may be contested as otherwise provided by law. Okay, this says, “any person desiring to contest the qualifications of another person as a candidate for nomination in a political party primary election shall file a petition contesting eligibility…” This means, Orly is a “person” notwithstanding she doesn’t live or vote in MS. And it says, ‘If the state party executive board has thus far ignored your request for relief; then, file a petition with the MS Circuit Court, which will petition the Supreme Court to appoint a special judge in the circuit court, to hear your plea.’ Sure enough, I looked up R. Kenneth Coleman, the judge named to hear the case. Who is Mr. Coleman? A retired Circuit Court judge. Only, of course, unbeknownst to the MS supreme court; she was still using the wrong law. That same paragraph allowing Orly to name herself a petitioner; also clearly states, this law only applies to a contest of a candidate who is nominated via a primary election. For example, the candidates for, say, U.S. Senator from the R party who want their names to appear on the general election ballot; are nominated for that role in the party’s primary contest. Party nominees for President are not chosen in primary elections but at Presidential nominating conventions. No; only delegates to that convention are chosen in the primary. If you are one of those people who ‘come hell or high water’ still ‘credit the ‘legal’ work of Orly Taitz, which work appears to be loosely focused on the issue of President Barack Obama’s Constitutional eligibility for office; then, I have to say, you are not one of those citizens to whom my work is addressed. Because at this point, if you still don’t understand what she is doing wrong then, you will never understand what I am doing right. Rest assured, while you are praying for the success of your personal savor in this endeavor, literally; and thereby are avoiding your civic responsibility to learn how our political system works and, to fix it, where it does not; I plow on with the heavy lifting, on your behalf. This entry was posted on Sunday, February 19th, 2012 at 19:29 and is filed under Uncategorized. You can follow any responses to this entry through the RSS 2.0 feed. You can leave a response, or trackback from your own site. According to a new post on Dr. C’s blog, the defendants filed copies of both the long and short form certificates as exhibits to their Motion to dismiss, as well as a link to the whitehouse.gov digital image in an item (#31) of the Memorandum. Curious as to your take on this. I just thought it was interesting that for the first time I’m aware of, the defendants have submitted copies of the certificates into the record. Does this give the plaintiff the right then to examine the originals for authenticity? In NJ, we saw defendant Obama’s attorney rejecting the submission of the documents; now in Mississippi, we have the defendant Democratic party offering them. Perhaps the sign of the beginnings of a new strategy? Interested: Okay, I get the game now. You make specious claim after specious claim in what you hope is a not-too-apparent attempt to get me to waste my time lending credibility to that claim by formulating a substantive response. Even when, after receiving your first empty claim, I ask for specific citations that you are telling the truth. Merely repeating your specious claim without providing the citations I requested evidences your subterfuge. Sorry, but I’m not playing a “game.” I have followed your blog for quite a while, and I just wondered what your take was on these new developments–and they are new. “Allegations”, “empty claim” and “specious claim after specious claim”? I didn’t realize I had made any allegations or claims, and never meant for my posts to be “specious” in any way. In the first post I simply linked to a Dr. C news item, and in the second, I observed that this is the first time, at least to my recollection, that the defendant in any of the “birther” suits has submitted the certificates into evidence, and also I noted the fact that in this case the defendant was the Democratic party and not Obama. I actually have no opinion on whether the certificate submitted is fake or not. I was simply asking for your thoughts, as an interested expert, on these new developments. Actually, I am a journalist, and if you weren’t so adamant on keeping your identity concealed, I would have liked to have corresponded with you on your interesting take on the whole election fraud issue. No attack was meant on my part. I read over my two posts again, and truly cannot see that they deserved the flavor of the responses you gave. I suppose this exchange merely highlights the typical problem with written communications not clearly expressing true intentions, especially under the cover of anonymity. You apparently took my questions as sly attacks; I read your respnses as unwarranted attacks against me. Shall we start over, or is this conversation doomed from the beginning? Interested: “Actually, I am a journalist, and if you weren’t so adamant on keeping your identity concealed, I would have liked to have corresponded with you on your interesting take on the whole election fraud issue.” HA HA HA HA HA! ksdb: HA HA HA HA HA! Double teamed by distraction! Conflating Federal Rules of Evidence with State Administrative Rules and Procedures; and adding name calling (“factlack” instead of FactCheck, for example) and lies (“they ignore that 18 Supreme Court justices agreed on a definition of natural-born citizen the (sic) precludes Obama from being Constitutionally eligible”). jbjd, you’re not understanding my post. I responded to Interested, not you. And sorry, but you don’t have first clue about the real issue here. This nonsense about “political advertising” ignores that this motion and others have cited the so-called campaign advertising in successfully defending the cases. The information on your blog is useless. You still haven’t accomplished anything and the latest letter from Texas proves your theories are a complete debacle. Sorry, but those are the simple facts. Excuse me for simply bringing an update on this case to your attention and posing a question. I quite mistakenly thought you’d be flattered that someone wanted to hear your opinion on the new development. I will give up making my motives any clearer. Believe what you want. I’m just glad that I provided you with a laugh this morning, and I can’t wait to read your article. Even after your mockery towards me, I am truly still interested in reading it. But, will it be filled with more ridicule and sarcasm against all the unwashed masses who aren’t as smart as you and dare to provoke your disdain? For someone clearly as intelligent as you are, you seem to have forgotten the fact that when you are fighting a cause, such open contempt doesn’t foster much enthusiasm among those who might have joined you. Go ahead and educate us on the issue at hand, please, but not on respect, manners, courtesy, and honesty. Anyone who reads these posts can judge your skills in those areas for themselves. I tried posting a reply twice, but instead of the usual “comment awaiting moderation,” it does not appear at all. I’m not sure if there is a problem with my posts, or perhaps I’ve been banned? My response contained links to Dr. C’s site, which included links to the actual Motion and Memorandum, and now he just posted another blog with the Judge’s Order embedded. I made no “allegations,” I merely referred you to the actual documents filed in the case. Back to part of my original question, does this action on the part of the defense have any interesting implications or ramifications? I feel like our conversation has truly taken place in the twilight zone. I merely quoted a comment made by someone named “nbc” on Dr. C’s blog, who I believe has established him or herself as an attorney. The comments about Orly and “judicial notice” were not mine. I thought my own comment made that clear. You accuse me of “doublespeak”, I could accuse you of reading things I have not written. How about a couple of very straightforward, simple questions? Have you actually read the Motion to Dismiss, Memorandum, or Order on this case using the link I provided you above? If so, do you have any comment? That is all I have been asking you. I never attacked you, nor intended to, in any way. I have been playing no games, have made no allegations, nor claims of any kind. I saw an interesting news item on Dr. C’s blog, backed up with actual legal filings, noticed they dealt with a plaintiff that was the Democratic party, and recalled your work in this area. That’s it. I simply was interested to hear your opinion. If you haven’t read these documents and don’t intend to, our conversation, or whatever this was, is over.